alaTest has collected and analyzed 79 reviews of Cambridge Audio AIR 200 V2. The average rating for this product is 4.5/5, compared to an average rating of 4.1/5 for other Audio Systems for all reviews. We analyzed user and expert ratings, product age and more factors. Compared to other Audio Systems the Cambridge Audio AIR 200 V2 is awarded an overall alaScore™ of 90/100 = Excellent quality. 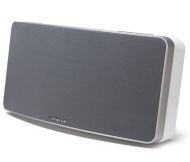 The Air 200 V2 is the second generation of Cambridge Audio's Minx Air wireless speaker, which comes equipped with WiFi, apt-X Bluetooth, AirPlay and Spotify Connect – the latter being a new addition to the feature list. The connectivity is a small problem, but the sound it soooo good. It takes a little getting used to, but 100w of sound with itunes and equalizer and apps etc as well as digital radio. It was bought for the home. I believe I got a bargain! Superb sound, easy to set up and looks smart. I bought this for work as I purchased another almost 3 years ago & I'm still impressed with it now ! I often use it in church/village halls & it fills the room with sound perfectly.